These days I like to consider myself a pretty handy around the kitchen. But I hardly started out that way. If you were to give her the chance Meghan would tell you about the time it took me three attempts to make Jell-O. I owe at least some of my success in improving to one cookbook in particular, Starting Out The Essential Guide To Cooking On Your Own by Julie Van Rosendaal. What I like about the book is it focuses in on a basic starting recipe. Once you feel comfortable with the basics you can then move to the ‘other things to do with it’ section which gives you ideas on how to take the recipe to the next level. Instructions: In a large bowl mix all of the dry ingredients. Once they are mixed add the butter and blend well. Next add the milk and stir until the dough comes together. Remember biscuit dough is sensitive to mixing, do not over mix or you will have tough biscuits. 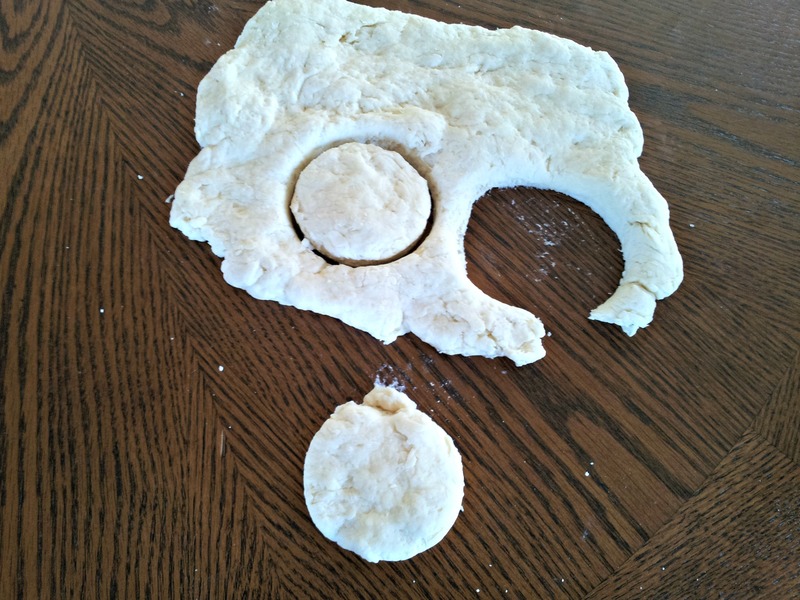 After you have your dough roll it out onto a flat surface so it is about 1 cm thick. Finally cut out your biscuits, I use our small drinking glasses to do so. Once you are done rolling and cutting bake them for 12-15 minutes in a 450F oven. Jam-Filled Biscuits– You know you’re going to put jam on them anyway, why not bake it right in it. Take your nicely formed biscuit and make a hole in the centre almost all the way to the bottom. 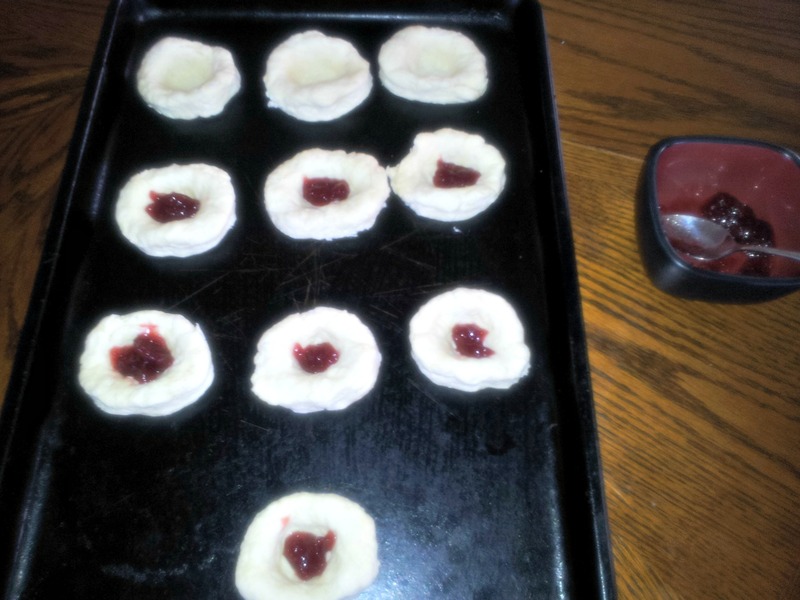 Build up the sides a little so you have a nice spot to drop a small dollop of jam. If my sweet tooth is really aching I sprinkle white sugar over top of the dough. These biscuits may take a little longer to cook, and the jam comes out extremely hot. My impatience has earned me more than one burned mouth with these! Cheese Biscuits– Follow all of the steps in the basic recipe and add 1 Cup of grated cheese. I like a mixture of marble and parmesan myself. I find this a nice addition to any red sauce pasta meal you make. Basic Scones– The only things that separates a biscuit from a scone is 1/4 Cup of sugar and 1/4 Cup of oil. Add these two things to the basic biscuit recipe and you now have scones on your hands. Cinnamon Raisin Scones– Plain scones are fine but I think we all know they need a little jazzing up themselves. My preference is cinnamon raisin scones. To do that I take my scone dough and add 1 Tsp of cinnamon and 1 Cup of raisins. Again if I am feeling that extra need for something sweet I sprinkle a little white sugar over them. Chocolate Scones– Now these are my wifes favorite. Start with your basic biscuit recipe but take out 1/4 Cup of flour and add 1/4 Cup of cocoa.If you left the dough there you would have chocolate biscuits. They look a lot like chocolate cookies but don’t taste sweet at all. I have made them twice and both times they were a let down. Anyway take your chocolate biscuit dough and add 1/4 of sugar and 1 Cup of chocolate chips. I like adding white chocolate chips for the contrast. As A Substitute For Bisquick Or Crescent Roll Dough On Pinterest– A number of Pinterest (follow me here!) recipies I have found call for the use of either bisquick or crescent roll dough. I don’t like using either of those things because I find the salt content too high,the quality of the pastry too low. Also I am not thrilled with the amount of preservatives in them. Plus my biscuit dough take me about five minutes to mix up. 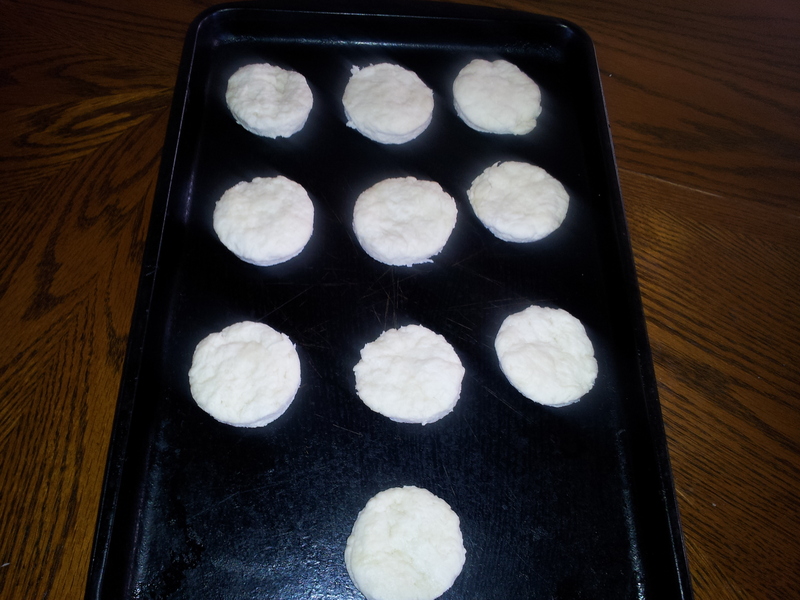 Whenever you see a recipe calling for bisquick you can always make your own biscuit dough instead. And sometimes you can use biscuit dough in place of crescent roll dough For example I pinned a Betty Crocker mini meat pie recipe that makes use of bisquick. Instead I made my biscuit recipe and added more milk (I think an extra 1/4 cup) to get the consistency I needed. As for crescent roll dough, I substituted biscuit dough for it when I made pigs in a blanket once. Truth be told pizza dough is better still I just didn’t have any on hand, or time to make some. There you have it one of my favorite recipes and a handful of easy alterations. The great thing about recipes like these biscuits is once you get the basics down pat you soon find your abilities to cook and bake improving by leaps and bounds. At least I know mine did. 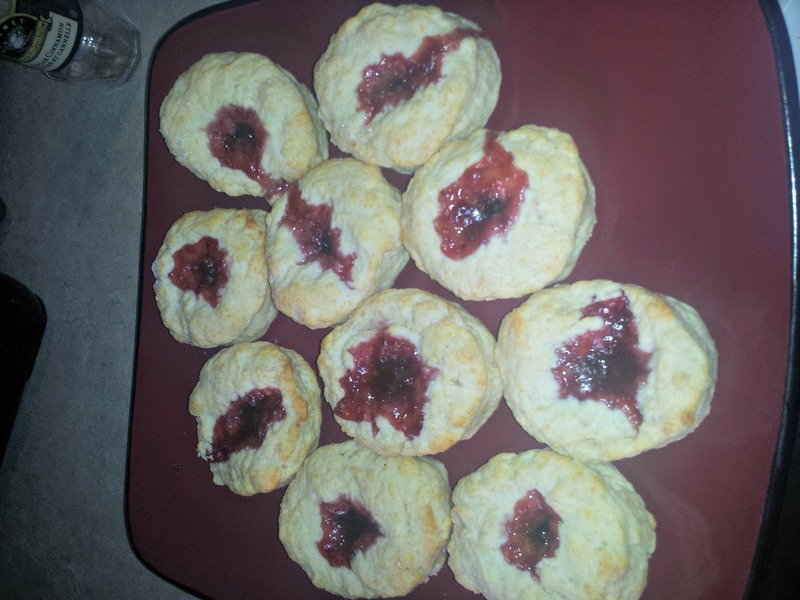 After writing about jam filled biscuits I just had to make these. *P.S. Some of the alterations I listed are also from the Julie Van Rosendaal cookbook while others are my own. The jam ones look delicious! We just made perogies and I’m tempted to make biscuits now too. The jam ones are very tasty. You should go for it and make them. They take a total of 20-30 minutes start to finish including clean up. Ha! I just made your jam-filled ones last week! I added 1/4 cup of maple sugar to the batter, and I subbed in whole wheat flour for the white. For future reference, I have to say I am not sold on using whole wheat flour in these (and I rarely say that when I sub whole wheat for white flour in a recipe!). Guess I shouldn’t mess with a good thing…. 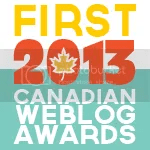 As I was making/writing this I was wondering how they would convert to whole wheat flour. Do you think a 50/50 mix of whole wheat and white flour would work? love love love the chocolate scones!!!! !